Posted on Sun, Dec 4, 2011 : 5:59 a.m. The long anticipated $754 million C.S. Mott Children’s and Von Voigtlander Women’s Hospital is set to open today, and administrators say they're prepared for any problems that might come their way during the transition from the old hospital to the new facility. As many as 210 patients —some very sick— will be transferred using an 800-foot indoor pathway to the new 1.1 million-square-foot hospital in an airplane-themed move. Children will be given a backpack and passport as the move begins. The transition is scheduled to take place between 7 a.m. and 7 p.m. The University of Michigan Health System expects 3,000 people total to assist throughout the day, including 300 volunteers. Nurses and physicians will man multiple checkpoints in case an issue arrises during the move. All involved officials will have a 'playbook' that outlines information on patients, emergency contacts, security plans, office and medical supplies necessary to each patient and other move-related details. The new children's emergency room —the first-ever pediatric emergency center at UMHS— will be the first to move and will open around 7 a.m. the morning of the move. UMHS says the driving push behind the move is to make the transition as safe and comfortable for pediatric patients as possible. The hospital, which was designed using input form staff, volunteers and former patients, was designed in the same vein, says Mott hospital director Pat Warner. "It will not be a crazy day,” Warner has said of the move into a facility that took more than five years to build and another decade to plan. Chris Dickinson, the medical director of the move, said in a recent interview with UMHS that an organized move has not come easy. "It's been a lot more work than I could ever have imagined," he told UMHS. "I suppose it's complicated because we made it complicated. We have spent a lot of time thinking of complicated “'what if' scenarios." AnnArbor.com has published more than two-dozen articles about the new hospital, informing readers on everything from the elaborate financing of the state-of-the-art facility to the restoration of the beloved Big Bird statue to plans for the original 1969 Mott building. Sun, Dec 4, 2011 : 11:19 p.m.
And people wonder why health care is so expensive. Three-quarters of a BILLION dollars for a building. Simply unbelievable. Sun, Dec 4, 2011 : 5:35 p.m. Isn't it wonderful to have a story that everyone can be positive about!!! Personally, I can't think of a better investment than in the well being of children and their mothers. Congratulations to everyone who had even a small part in this achievement. Sun, Dec 4, 2011 : 4:49 p.m.
Sun, Dec 4, 2011 : 4:39 p.m.
Sun, Dec 4, 2011 : 3:16 p.m.
congrats on opening day! a big thanks to the volunteers, the donors, and the construction workers who made this all possible. its a beautiful facility. best wishes/thoughts to the incoming patients..
Sun, Dec 4, 2011 : 2:54 p.m.
Keeping all of those precious patients in our prayers for a safe move! God bless ALL of you who work at Mott and take such great care of the children. We know first hand how special you all are and we are over the moon with joy with this much needed new hospital. Only good things will come from this journey that begins today. Congratulations! Sun, Dec 4, 2011 : 1:55 p.m. 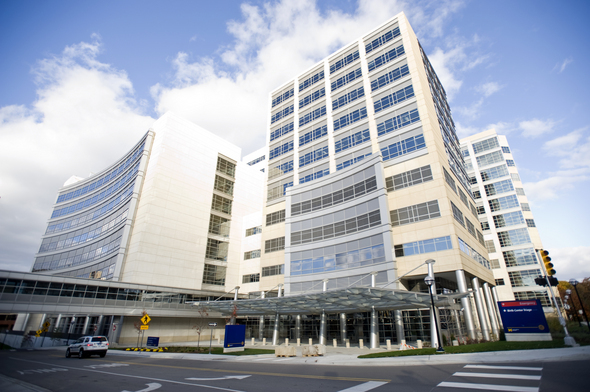 Wonderful and exciting work at the U of M Health Systems - I have been a St. Joe - Ann Arbor man for my entire life -I worked at the old St. Joe on Ingalls as well as the Huron River Drive location, my father served on St. Joe Medical Staff for 35+ year and my stay at home mother, an RN, was President of the Women' s Auxilary back in the 60's. Fine, fine work to the medical staff, nursing staff and all of the other hard workers at U of M! The children of Ann Arbor, Washtenaw County and the State of Michigan are the real winners in this story. Continued success in your never ending mission to care for the sick! Sun, Dec 4, 2011 : 12:13 p.m.
Sun, Dec 4, 2011 : 1:29 p.m.
Kara, did they get anything special for being the first patient? I'm sure they were told though. Sun, Dec 4, 2011 : 11:21 a.m.
Sun, Dec 4, 2011 : 4:07 p.m.
18 years is the cutoff - and an important note, psychiatric emergencies in children and teens will still be handled at the main psychiatric emergency service, next to the adult emergency department. Women in labor will go to the 'front door' of the new hospital, which gives them quick access to elevators to the Von Voigtlander Hospital floor that includes the birth center. Sun, Dec 4, 2011 : 1:06 p.m. When are kids deemed &quot;too old&quot; for Mott's ER? How far apart, physically, are the UM ER and Mott ER now?